You won't get cottage cheese thighs with these pancakes. Higher in protein and lower in fat than traditional pancakes these flapjacks are dense and satisfying (two medium sized cakes will fill you up). John and I love them! In a large bowl, stir together flour and baking soda. In a medium bowl, whisk together the milk, eggs, and honey. Then mix in cottage cheese. Stir dry ingredients into wet ones. Coat a large nonstick skillet with cooking spray and heat over medium. Working in batches, drop pancake mixture by 1/2 cupfuls into pan. Cook until bottoms are set and tops have small bubbles, about 1 minute. Turn pancakes and cook until just firm in the center, 1 to 3 minutes more. Repeat. These are the best and I am not allergic to eggs so keep makin' them!!!! @Joe: glad you can use the recipe ideas! 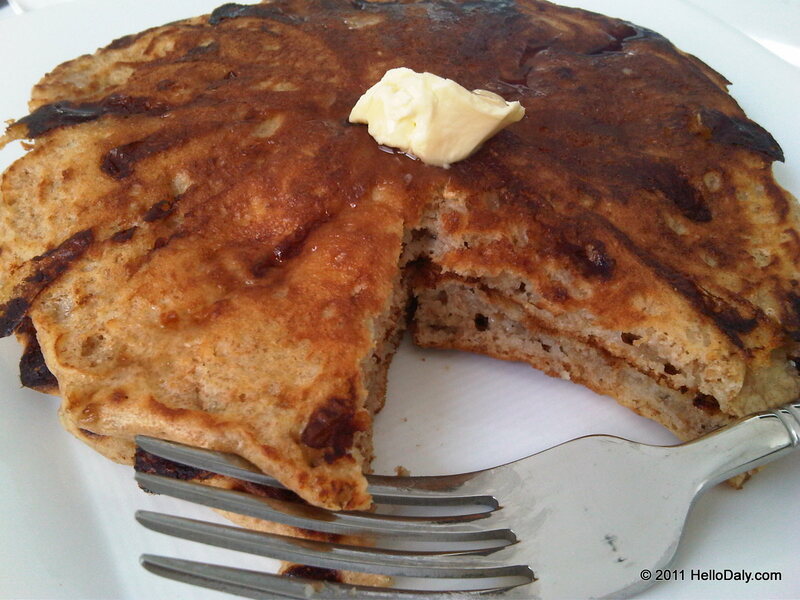 @Chante: Sam may not be able to tell there is cottage cheese in the pancakes but the texture is different. I fed them to a friend and was pleasantly surprised, she loved them!